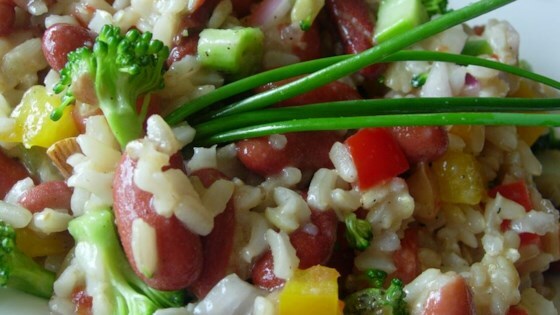 "This delicious cold rice salad has the great flavors of brown rice, fresh veggies, and chopped raw almonds. This has replaced high fat, low nutrition picnic salads in this household." Combine the rice and water in a small saucepan; bring to a boil over high heat. Cover, and reduce the heat to medium-low. Simmer until the rice is tender, and the liquid has been absorbed, 45 to 50 minutes. Remove from heat and allow to cool. Place cooled rice in a large bowl. Stir in the kidney beans, red onions, mushrooms, broccoli, bell peppers, and almonds; season with pepper. Toss salad with the Italian dressing and olive oil.